Talon is kind of a jerk. Despite his jerkiness, he loves on a level that doesn't allow for him to simply walk away. Once you're in Talon's circle, you can't help but stay there. Talon has enhanced abilities that allow him to be both dangerous and helpful, all wrapped in to one. He collects other enhanced men to create the perfect team of law enforcement. Then you have Finn. He's skittish, kind of beaten down because his family is horrible! He is hoping to work for the FBI, but soon realizes that he's only getting a chance because of his father's letter. Despite that knowledge, Finn hopes to impress enough that he will be accepted. This is a fast-paced book with a lot going on. I love how protective the team becomes, so quickly, of Finn. I do hope that other characters in this story receive their own. I love the dynamic between Talon and Finn, even if, at times, it's super frustrating. The chemistry between Talon and Finn is somewhat lacking, but their friendship is outstanding. Overall, this was a great story. I would definitely read more of Sue's stories. I have to say that while there were certain parts of this book that I really enjoyed, there were others that left me feeling sort of lost. I really liked the situations Finn ended up in and how he handled them. He was the new kid who did the best he could with what he had or what he knew. Heck, I just loved Finn's character completely. He was awesome as he tried to deal with the very different situation he initially found himself in. The plot was interesting and I enjoyed the twists and unexpected turns. However, I have to say that while I understood Talon's reasons for being the way he was, it just felt sort of sprung on us as a reader and not something that was relatable. Also, the way the crew all came together was a bit... odd to me. While Finn was doing good, it seemed like we really didn't get to know why the other team members were supporting him... well, some of them more so than others. It just felt like the camaraderie wasn't quite real to me. VICTORIA SUE… Wrote her first book on a dare from her hubby two years ago and he says he has regretted it every day since. Loves writing about gorgeous boys loving each other the best—especially with either a paranormal or a historical twist. Had a try at writing contemporary but failed spectacularly when it grew four legs and a tail. Loves her wolves! 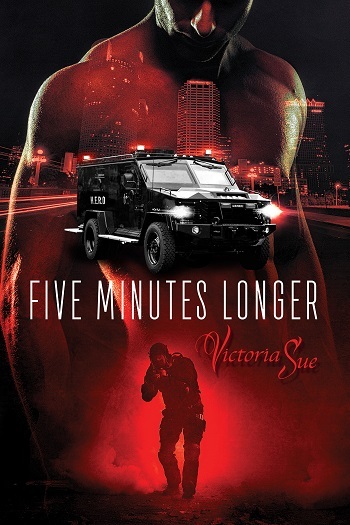 Reviewers on the Wicked Reads Review Team were provided a free copy of Five Minutes Longer by Victoria Sue to read and review.